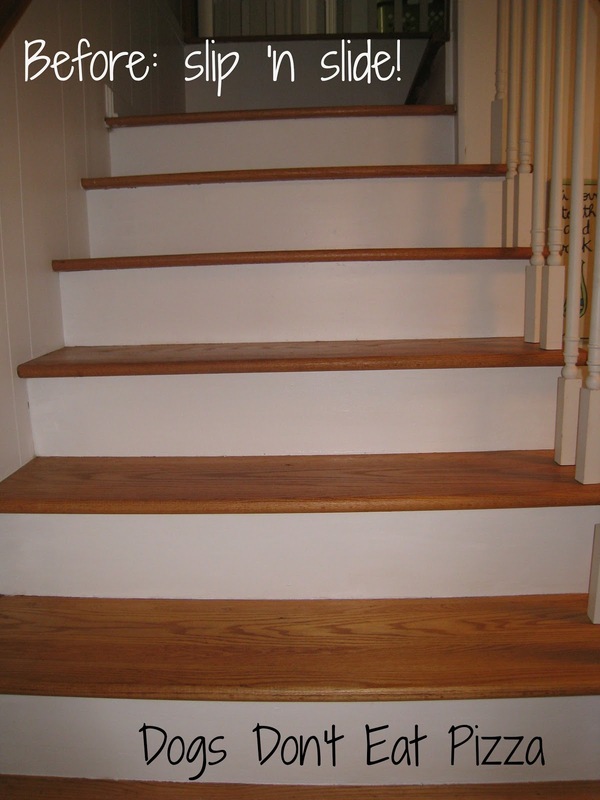 You are here: Home / Quick Room Updates / Bare Stair Problem Solved! As you may recall from this post, I took the nasty, dirty carpet off our stairs. Then our dogs starting falling, Scooby-Doo-style, down the stairs. I sent out a wood stairs SOS and you replied with great ideas. I liked my friend Hilary’s idea to train the dogs to go down the stairs slowly. Not only was this the least expensive idea (dog training I can do = free), but avoided the less-than-attractive, utilitarian carpet treads I had ordered that I really didn’t like. Well, apparently training can only go so far. I mean, when you have a squirrel outside the window, or neighbors jogging down your street, man, you have to RUN to the window and bark as soon as caninely possible. You can’t think about doing anything slowly. Stairs shmairs. And down they would go, slipping and sliding the whole way. Training flung out the window. The other day, I was reading the blog Cleverly Inspired and saw where she had removed carpet from her stairs and put these nice-looking sisal treads on her stairs. They weren’t as pretty as the bare wood, but they were better than the beige carpet pieces I had ordered and they matched the sisal runner in our adjacent hallway. So, I ordered them. The website said that the treads were “pet-friendly,” so I’m taking it at its word. That said, they haven’t met Bear and Hank. The treads arrived Friday and I installed them today. Whaddaya think? Not too bad, right? Actually kind of ok. I ordered them from Natural Area Rugs. (This isn’t a sponsored post; this is just what I did.) It took about a week for them to get here after I ordered them. 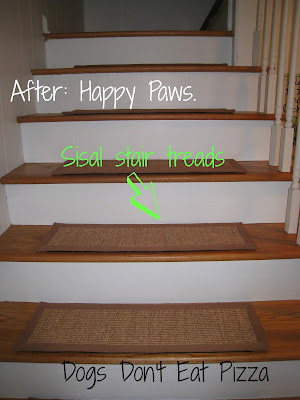 They were incredibly easy to install: just peel off the adhesive backing from the hook and loop fastener on the back of the treads, and stick them to the stairs. You can take them off to clean by simply removing the tread from the hook and loop (velcro) fasteners. Easy peasy mac ‘n cheesy (my daughter told me to say that). The main thing: Bear came tearing down the stairs today (tennis ball + kids outside = go fast) and she didn’t slip. She almost smiled (I swear, really). Same with Hank. Totally better. Bare stair problem solved! You know, they aren’t as pretty as the wood. But I will sleep better knowing that the dogs have some traction when they go down the steps. Note: One friend had suggested that I put rubber-soled slippers on the dogs’ feet. My dogs (and, honestly, any self-respecting dog) would not put up with that, but I did see some at PetSmart last time I was there buying dog food. They even sold Halloween ones. Who knew? I’ve got bare stairs – but I don’t have a dog! Much better than slipper socks for your pooch! !